This entry was posted in Black Swan Event, Civilizations unraveling, Dark Ages, Drumbeat of War, Earth Changes, Earth Watch, Financial System Collapse, High-risk potential hazard zone, New World Order -Dystopia- War, Prophecies referenced, Resource war, Rising tension between nations, Rumors of War, Time - Event Acceleration. Bookmark the permalink. This could get interesting if someone blinks. The beating of the drums intensifies. War is on the horizon………………. Recently, China posted potential West Coast targets that are within range of their nuclear submarine missiles. A warning,threat? Also, there was a report of a meteorite passing near Seattle but it is widely believed it was a Chinese missile test which has happened before. Nov 29 (Reuters) – China sent several fighter jets and an early warning aircraft into its new air defence zone over the East China Sea on Thursday, state news agency Xinhua said, raising the stakes in a standoff with the United States, Japan and South Korea. Japan and South Korea also flew military aircraft through the zone on Thursday while Washington sent two unarmed B-52 bombers into the airspace earlier this week in a sign of support for its ally Japan. None of those aircraft informed Beijing. China last week announced that foreign aircraft passing through its new air defence zone – including passenger planes – would have to identify themselves to Chinese authorities. 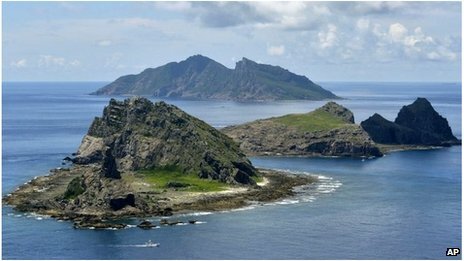 The zone includes the skies over islands at the heart of a territorial dispute between Japan and China. The Chinese patrol mission was “a defensive measure and in line with international common practices”, Xinhua cited air force spokesman Shen Jinke as saying.